Japanese restaurant ZAUO, which plans to debut its first U.S. location in New York’s Chelsea neighborhood next month, takes the choose-your-own-adventure one step further: You can catch your own fish for dinner. “The idea of ‘how fun it would be to have a restaurant where you could fish on a boat’ was what gave birth to our creation, ZAUO.” That’s the entirety of the “about” section of the restaurant’s Facebook page, and it neatly sums up the thrust of the place. An obvious reaction to hearing about this concept is dismissing it as a gimmick—hey, didn’t that work for Benihana and Hooters? But the Takahashi family says the fish-for-your-food schtick is not only entertainment but an opportunity to show diners where their dinner comes from. “We do want people to have a good time, but there’s a message we want to send that you’re eating a life. You’re killing a fish and eating it, and in Japan we pray before every meal and say, ‘Thank you for the lives you have given.’ Thats the message behind this restaurant,” Noriki’s other son Kazuhisha Takashi tells Eater. I’m left with a few questions, namely, what happens if I’m a less than successful fisherperson? 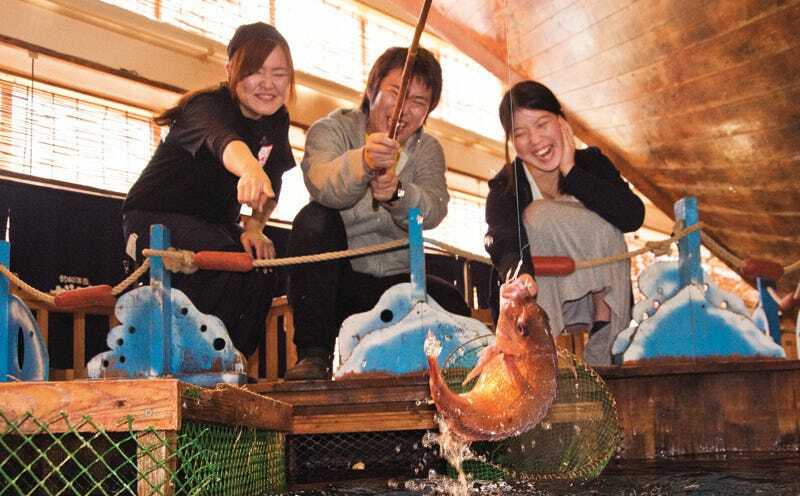 ZAUO’s website assures me that “if you cannot catch easily, you can listen to the fishing tips from the staff.” It would be just my luck to still be watching my bobber while everyone else feasts on their sashimi. Is Hooters as delicious as it is demeaning?